In 3 weeks, the founders of Yardsale built and launched the first version of FOBO (Free or Best Offer). A lot of startups talk about launching fast and iterating, but sometimes you see a company doing it extremely well. Just watching this team execute, I felt like there were lessons worth writing about. 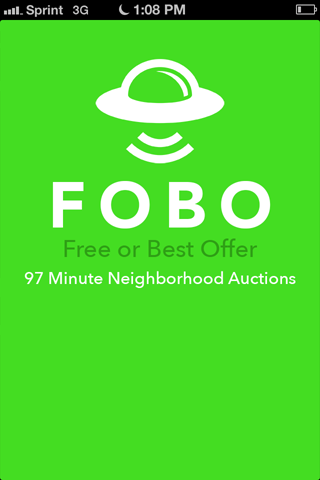 How FOBO works: everyone has something that you'd like to give away or sell, but don't have time to research and optimize price, deal with dozens of emails, and coordinate pickup, or ship the item, in the case of eBay. You post it on FOBO and they instantly price it (using a catelog of eBay historical sales) and they guarantee that your item will sell in 97 minutes. My take: I have things I'd like to get rid of, but I'm too busy to post and negotiate for things on Craigslist. Some of the things are really valuable, so I'd love the option of at least making some money on it. 1) The founders built the first version 3 weeks. They didn't spend weeks debating color gradients. They know that gradients won't create product / market fit, so they're focused on the things that matter. In fact, they found out fast that many of their original assumptions were wrong (which is the case for most first versions of products), but since they built it in 3 weeks, they had plenty of time to iterate. 2) They forced every new feature to fit in a 2-day spec. So, they avoided long (and dangerous) development cycles. The version that you’re seeing launched on TechCrunch is version 262. 3) They didn’t launch with payments. They manually sent all payments via paypal. 4) They used old code whenever possible and built everyone on Parse. With no back end coding they just focused on user facing functionality. 5) The founders did everything they can to make sure their initial users are happy. Ryan (one of the founders) listed his personal cell phone number in the app and all newsletters. When I reported a bug and then didn't reply, they contacted me several times, sometimes over text, until the bug was fixed. (He's a friend, so he has my number). 5) It's a two sided marketplace and they're doing everything they can to seed the marketplace with buyers and sellers. The founders offered to come over and help me post things. They're also buying and selling products themselves. 6) They have a revenue model. In the event you sell something, they take 15%, which is completely reasonable. They're building a real business immediately into the product. I'm glad they're not telling users that they'll get paid on the credit card fees at volume. Ryan just told me that they’ve paid for rent with it several times over. 7) It's hard to put my finger on it, but there's something really creative and compelling about the product. It makes me think about how Twitter and Vine took off. I find myself checking FOBO daily to see what's available. I think it can be valuable to write about companies after they're multi-million dollar companies, but sometimes, it's interesting to see how a team operates to get initial product market fit. If you'd like to try it out, go to fobo.net! I had not heard of FOBO before, but that's definitely an inspiring story - and it seems like a really helpful site! Justin, it was great watching their process. Every week they'd send out an email describing the lessons learned and the things they were going to try next.